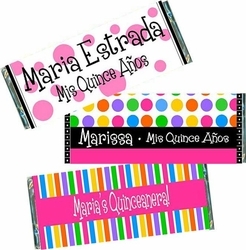 Are you looking for the coolest Quinceanera Candy Bar Wrappers and Candy Bar Favors? Well, you have come to the right place! A Quinceanera always requires a SWEET favor. Treat your guests to a chocolate bar covered in one of our trendy SWEET 15 and Quinceanera candy wrappers. There are more designs on the way, so check back often! We will custom design a candy bar wrapper for you FREE! We will add a photo to your wrapper FREE! Just email us info@candyundercover.com or call us toll free at 877-235-2828 and we will be happy to assist you! Order the fully WRAPPED CANDY BARS. We will do the work for you! Your Quinceanera favors will arrive to you all ready to pass out to your guests.